Helix Linear Technologies | Ohio Belting & Transmission Co.
As a distributor for Helix Linear Technologies, we make it easy for you to purchase high-tech lead screws. Want to order lead screws you can't find? With the release of their new precision lead screws, Helix produces the broadest product line of any lead screw manufacturer globally. You could purchase precision rolled, milled or ground screws in diameters from 1/8" to 6", or 3mm to 150mm. You can also purchase leads from 0.024" to 3" or 3mm to 75mm. Backlash is the relative axial clearance between a screw and a nut, minus rotation of either the screw or nut. It always increases with use and can be detrimental in precision applications where even the smallest change can throw off an entire application. Hence, acme lead screw designs need to compensate for backlash so that inaccurate positioning doesn't occur. 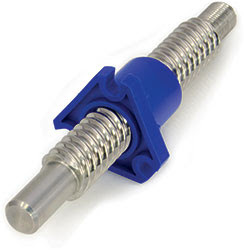 How do you reduce or remove the backlash between the screw and the nut? There are several ways. For screw diameters over 5/8" it's typically recommended that a no-lash flange is added to the assembly. You can also have your lead screw assembly designed so that the nut has anti-backlash properties. When it comes to minimizing or eliminating backlash, it's all about design. So take the time to select one that reduces friction, wear and promotes a long component life. When selecting an acme lead screw, another important consideration is the load that it will be working with. Failure to take this into consideration can lead to decreased screw efficiency, which can thereby lead to a shorter lifespan or complete failure. There are five types of loads that impact screw assembly performance: tension, compression, thrust, overturning and side. Get familiar with each of these types of load types and how your screw is likely to be affected. It's also important to familiarize yourself with the load classes, which include static load, dynamic load and PV load. Acme lead screws are generally far less cumbersome to maintain than competing technologies. However, a big part of ensuring their long lasting, maintenance free life is choosing the right lubrication for your application. Acme screws involve friction when rotary motion is converted into linear motion, as the coefficient of friction between the nut and screw is called upon to position loads. However, the right lubrication can not only reduce this friction, but limit wear, reduce maintenance and extend the life of the application. Aside from friction reduction, lubrication also transfers heat, carries away debris and contaminants, transmits power and guards against wear and corrosion. Along the lines of lubrication, there are two main types that are used when it concerns lead screws: liquid and non-liquid. The former generally consists of petroleum-based oils that don't chemically react and are able to operate at high temperatures. Conversely, non-liquid lubricant, or dry lubricant, uses grease, powder or air cushions to lubricate applications where liquid lubricant is ineffective or not practical. Furthermore, specially engineered materials exist to essentially self lubricate the screw and nut, although these self-lubricating materials are less common than using either liquid or non-liquid lubrication. While acme lead screws are a huge player in linear motion applications, there's a lot to consider when selecting the right one for any particular application. Failure to carefully analyze and select the right screw or assembly - with the right properties - could lead to an application that's more likely to fail.